Four men are in police’s sights after they allegedly stole surveillance cameras from a Gold Coast shed and took them to a nearby property – all while live-streaming the security footage to the home owner’s mobile phone. The property owner, a 37-year-old man, was at his home 1000 kilometres away in Mackay at 4.20am on June 30, when he received a notification on his phone. The alert notified him of a security breach to a shed at the back of his Amazon Circuit property in Helensvale, which was under construction. He was then able to watch a crystal-clear live-stream – uploaded to his mobile in real-time via surveillance cameras mounted at the construction site – of four men allegedly breaking into the shed and stealing solar panels, a modem and the surveillance cameras themselves. 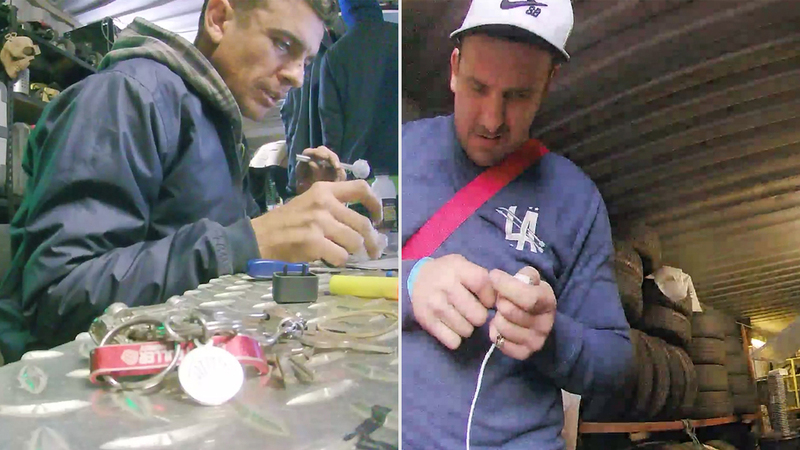 In the footage released by Queensland Police, one of the men is seen unplugging cables inside the shed, while another is seen calmly smoking whilst staring off at the ceiling as another man stands with his back to the camera at a computer screen. But the alleged thieves’ bumbling didn’t end there. Police allege that they took the security cameras to another property, where they live-streamed themselves taking illicit drugs. Investigators have already arrested a 29-year-old Gaven man at a home on Connemara Street. He will appear at the Southport Magistrates Court tomorrow, facing charges which include stealing, possessing a weapon and possessing a restricted item. Police are now seeking the public’s help to identify and find two other men wanted over the robbery. One of the men, pictured above, is described as European in appearance, aged in his 30s with short brown hair and fluorescent green ‘spacers’ in his earlobes. He appears to have a diamond tattoo on his neck. The second man is of Caucasian appearance, also aged in his 30s, with a lean build, short brown hair and blue eyes. Anyone who has any information that could help police is urged to contact Crime Stoppers on 1800 333 000 or online.